This past week, I was re-scanning some of my grandmother's old photos from her service in the U.S. Coast Guard SPARS during WWII. (I wrote a short blog post about it here.) In many of these photos, my grandmother is pictured with fellow SPAR women, and a few military men as well. The great thing about her photo album is that, for nearly every photo, she wrote down each person's name and where they were from. So, as I was scanning, I came across several photos of an Army man by the name of Bart Noland from Iowa. I was curious. I Googled 'Bart Noland Iowa army,' but didn't really come up with anything. I went to Ancestry and searched for him. In a public tree on Ancestry, I found a Bartley W. Noland from Iowa who was born in 1918, so I decided to message the owner and hope for the best. Even though she now has all of the photos in digital form, I will be sending Bart's daughter the physical photos of her father, as well as a photo of his barracks he stayed in while in Florida, and some scenic snapshots he sent my grandmother during his time in Hawaii. They belong to her and her family. I can always have the photos of him reprinted if I want to fill in the empty holes in my grandmother's scrapbook. Are you in possession of any old photos of non-family members? If you have names attached to those photos, I urge you to use your research skills to try to find living descendants of those pictured, and, if possible, return those photos (or at least email the scans) to living family members. Bart's daughter was SO grateful to me for reaching out and finding their family - She found out about these photos on her 35th wedding anniversary and said she felt like this was her Dad "remembering" this special day for her. I haven't posted on this blog recently, but that doesn't mean I've haven't been busy in other genealogy-related ways. If you read my blog frequently, you know that my husband's family, past and present, hail from western Ohio. Last month, I took a trip to the village of Minster, Ohio, which is located in the southwestern part of Auglaize County. I visited the Minster Historical Society and Museum, and wanted to share a couple of the resources available to researchers who have ancestors from this portion of western Ohio. I should mention that ANYONE can send in copies of funeral cards to add to their collection. I recently received my grandmother-in-law's collection of funeral cards and I'm in the process of scanning them right now. From what I saw on my trip, I know that they already have a lot of the cards I have, but they also DIDN'T have some, so I will make sure I send them copies of those. A couple of weeks ago, FamilySearch posted on their site the images within their Ohio, County Death Records, 1840-2001 record set. Previously, I had to check to see if an ancestor's death record had been indexed, and, if so, I had to order a copy of the image from their photoduplication service. This release of images was a big deal for me, because just about all of my and my husband's ancestors lived in and died in Ohio. I was somewhat disappointed, though, to see that death records for Darke County in western Ohio were NOT included in the record set. My husband's French Catholic ancestors settled in the northeastern part of that county, and I was looking forward to finding some of their death records. Not one to dwell upon disappointment when there were so many OTHER county records to comb through, I decided to search through Mercer County's images for ancestors from my mother-in-law's side who settled there in the 19th century. I was searching through the entire set page-by-page, and I found a lot of ancestors whose records had not previously been indexed and whose names were indexed or transcribed so poorly that there proper names didn't show up in the search engine results. Suddenly, I came across the name 'Crist Magato,' who was my husband's FRENCH 4th great-grandfather through his paternal grandmother's line. Christopher never lived in Mercer County, and, according to this death record, he didn't die there either. (Click below for larger view.) The death record states that he passed away in Osgood, which is a small town located in Patterson Twp, Darke County, about a mile south of the Mercer-Darke county line. 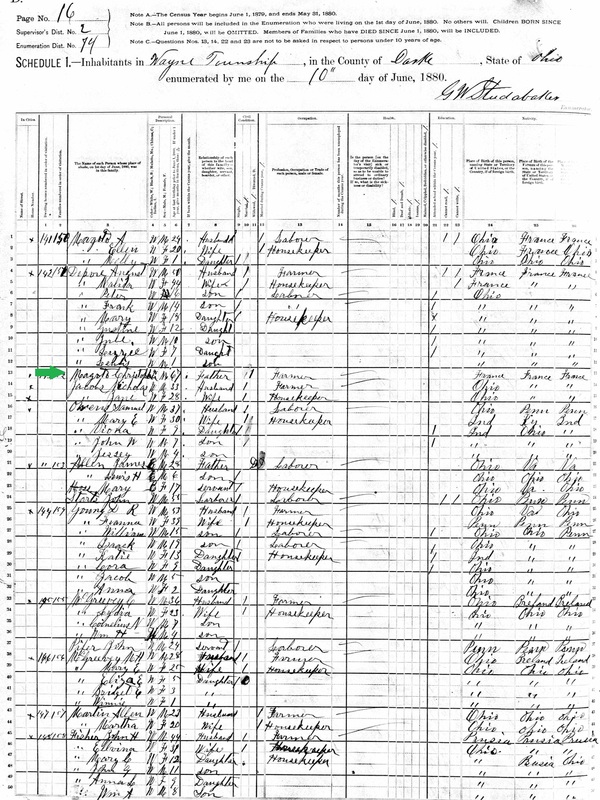 In the 1880 U.S. Census, Christopher is living in Wayne Twp, Darke County, which is directly south of Patterson Twp. He is also buried in Frenchtown, Wayne Twp, so I assume he remained there until his 1892 death. I am glad that I stumbled upon a death record for him, but now, I have more questions. Why did his death occur in Osgood, and not closer to where I assumed he was living. Maybe he was staying with a family member in his old age? I have not yet located his obituary, but that might provide some additional clues. And why was his death recorded in Mercer County? As I mentioned above, I searched the entire Mercer County set for our family tree surnames, and this is the only Darke County relative I have found in Mercer County records. This experiences has taught me, though, to check record sets for adjacent counties, just in case an assessor or recorder decided to jot down a death that may have happened near, but not technically within, county lines. This past weekend, I attended the 2014 Midwestern Roots conference in Indianapolis, Indiana. It was a great experience and I learned so much about practical tools and methods that will surely help me in my family history research. When I have attended other seminars and small conferences in the past, I usually just kept a copy of the handouts/syllabus in front of me while jotting down extra notes here and there. During one conference, I had an PDF of the syllabus on my iPad and typed out notes and saved electronically. But THIS time, I didn't take any notes other than the small blurbs that I posted on Twitter as the presentations were happening. I didn't have any extra or pens papers in front of me. Like every other larger conference, the organizers encouraged us to tweet using a unique hashtag, which I did include in every one of my tweets. Let me tell you the benefits of this method of note-taking. First of all, I had no extra folders, papers, or pens in front of me; my space felt uncluttered, which was a nice feeling. Because I wasn't worried about copying down every single little thing, I LISTENED better to each presenter, and I'm pretty sure I retained MORE of their information. Twitter limits you to 140 total characters, and since part of every tweet was the hashtag and presenter's name, sometimes I only had around 120 characters to work with. I had to craft each "note" in the most succinct way possible, and that forced me to pull out only the most important elements of each point the presenter was trying to make. If I wanted to remember a particular source, website, or book that the presenter was talking about, I tweeted that, too. After the conference ended, I went to my twitter account, searched the conference hashtag (#MWR2014), and ALL the tweets with that hashtag showed up (even from people who I did not follow or who did not follow me). Even better? You can SAVE the Twitter search in your Evernote, and have a complete record of everyone's tweets and photos from the conference in one easily-accessible location! Even if you don't think that this method of note-taking at conferences is right for you, you should still get a Twitter account (it's free), search the conference hashtag, and take advantage of the information that fellow colleagues are posting. Last week, I made my first ever trip to Salt Lake City, with one of my goals being a couple of good research days at the Family History Library. A couple of weeks ago, I wrote about my general preparations and goals: focusing on only a few family lines and only looking for indexed records or records for which I already knew where and when certain ancestors were born. With only two days, I did not have time to sit down with a gazetteer and try to search the microfilms for every village in which Great-Grandpa Kowalski may have been born. Originally, I was going to use an online form to contact the library beforehand and let them know what films I would like to search. I messaged them a few times through Facebook, and they assured me that, because none of the films in which I were interested were solely kept in the Vault, I should have no problems finding them when I arrived. Well, with my (bad) luck, wouldn't you know it, but the first film I search for was not in its proper place in the microfilm drawers. One of the volunteers kindly helped me search the overflow drawers and even looked around at other patrons to see if they were using it, but we couldn't find it. He ordered it from the Vault and it was thankfully there the next morning! Phew! In the past, I've also had notoriously bad luck with getting the hang of different types of microfilm machines, so I was a little worried about that on the first day. Turns out that I had nothing to worry about; the machines were well-maintained, easy-to-use, and instructions were printed on each one. Not to mention the fact that there were many library volunteers eager to assist anyone who needed it. This is the machine at used for 2 1/4 days. I sat at the same one each day; it was next to a wall outlet, so I was able to charge my phone when it ran low on battery. Before I arrived at the library, I knew that if I wanted to save any images digitally, I would need to transfer the microfilm reel to one of the special scanner computers that had USB drives. I fully intended to do this, and even bought myself a new USB drive. However, I quickly realized that, with the number of records I wanted to save, and considering that the scanner computers had time limits of only 30 minutes, this process would severely cut into my available research time. So, instead I experimented with taking photos of the records directly off the microfilm reader with my iPad 4 and iPhone 5. After carefully reviewing a few images - zooming in, looking at clarity and details - I determined that these photo images were more than adequate digital records of what I was looking at on the microfilm reader. Of course, the photos were saved in JPEG format, but I could easily convert them to TIFF format when I save them to my permanent hard drive and cloud. Each time I located a record of interest - one that I photographed - I wrote down the name(s), date, location and film number in a steno notebook. I was very careful to maintain my notes in the exact order of the photos I took, so that when I do go to organize the record photos into their proper "family" folders, I will know exactly what record I am looking at and who it 'belongs' to. Business cards aren't just for business people anymore. Yes, conventional working professionals still carry around business cards with their titles, companies, and contact information printed on them, but nowadays it has become common for other members of society to make and hand out 'business' cards. At the beginning of the school year my son's teacher handed out her 'card' in the form of a magnet - we keep it on our fridge and it has proved to be very handy. Teenagers looking for babysitting or lawn maintenance jobs have business cards just in case they happen to cross paths with a potential client/employer. Stay-at-home moms carry around 'mom cards' that they can hand to other moms who they meet at playgroups or at the park. And, if you are a genealogy blogger (or any type of blogger, for that matter), you should have some business cards, too. Last year, I had some of my own cards made. My brother was getting married, and I knew I would be seeing some of my Dad's cousins who I really never see at any other time. I wanted an easy way to give them my genealogy website URL and email address, without them having to fiddle with their phone or find a pencil and paper to write it on. Sure enough, I handed out a few at his wedding, so that mission was accomplished. Fast forward to just a couple of months ago. I was attending a seminar at the Indiana Historical Society. During one of our breaks, I introduced myself to one of the programming and education employees, gave her one of my cards, and simply let her know that if she or other members of the programming staff were interested in putting together a seminar on genealogy blogging, I could probably help out with that. She thanked me, the seminar started back up, and I went back home not really expecting much of it. A few days later, she emailed me and asked me to come in and speak with her about putting together some children's genealogy programs for them, based on my new blog, Growing Little Leaves. Even if you only blog as a hobby (as I do), you never know when or where you may want to share your blog and/or contact information with someone. You could be doing research at a library and bump into someone researching the same areas and/or families as you, or you could be at a seminar or conference and meet someone who could even be a potential relative. Most bloggers focus on using digital social networks, such as Facebook, Google+, and Twitter to expand their readership, but it is important to keep utilizing this more traditional method of networking. I ordered my cards through Vistaprint, but there are a handful of other websites on which you can design your own cards, usually at very economical prices. Office supply stores, like Staples and Office Depot, can also help you design and print cards. You are completely in charge of what you want on your card - I put my name, email address, phone number, and home address, along with my website URLs and the major surnames I research. Today, at the Indiana Historical Society in Indianapolis, Indiana, I attended an all-day seminar given by Cyndi Ingle. For those who aren't familiar with Cyndi, she is the creator of Cyndi's List, which is a website containing the MOST comprehensive listing of ALL genealogy-related websites - research sites, database sites, methods and organization sites, history sites, blogs - everything. She is quite famous within the genealogy community, so I was glad that she came to Indy and that I had the opportunity to hear her speak. The seminar was entitled, "Genealogy Online: Productive, Organized and Successful." Of course, Cyndi took us through her website, explained HOW it was organized and highlighted some of the main categories of links found there. She gave us some great tips about how to develop a research plan, and she was even kind enough to provide us with links to templates to help us make a research plan of our own. She talked a lot about using Evernote in genealogy research, which I wasn't necessarily expecting, but I'm glad she did. I do have an Evernote account; however, I do not use it regularly in my research and my Evernote notes and notebooks are not as organized as I would like them to be. Cyndi showed us Evernote's full capabilities as far as aiding in genealogy research and organization. And there's an entire section on her website listing links that are helpful in learning and using Evernote for family history research. - Take research notes along every step of the way. Cyndi referred to it as 'having an ongoing dialogue with yourself.' This is so important when you have to leave your research alone for a period of time. We need to know exactly what we were working on and where we left off in the search, especially so we don't backtrack and search the same database or record set AGAIN to no avail. - Genealogy research is a circular process; there is no end. She showed us this GREAT graphic from the FamilySearch.org Research Process Wiki, which really helped me better visualize what a successful research process looks like. - Speaking of visualization, she reminded us to try to visualize our research as much as possible. Using timelines and maps of migration and immigration patterns can all be extremely helpful when we are trying to put all the pieces of the puzzle together. If you ever get the chance to hear Cyndi speak live, please be sure that you do! She is an engaging speaker and you can tell that she really loves what she does. After her seminar today, I am so much more motivated to put more of my research in Evernote, and to be more meticulous in making research plans and keeping better research notes. The census form lists their address as 3521 East Blvd, and the city directory lists it as 3591 East Blvd. I searched for both addresses on Google Maps and Google Street View and came up with nothing; there are not even any addresses on the current extent of East Blvd that are close to the 3500s. My initial thought was that this part of the street had changed names between 1940 and the present day. To solve this mystery, I decided to consult the 1940 census enumeration district (ED) maps, which, fortunately, are found online. Turns out, the census enumerator wrote the wrong house number for the Licciardi family's address on the 1940 form. He wrote '3521,' which, if you look carefully, doesn't even fit the sequence of the other addresses on the page. And, upon further searching, I discovered that there isn't even a lot at 3521 MLK Jr. Blvd. Thank goodness for the city directory, which DID have the family's correct address (3591). I HAVE located the home via Google Street View and will be talking about it in a separate post later this week, so stay tuned! All family historians know the value of libraries and their vital roles in genealogy research. Local history books, church record books, microfilms, tax records, probate records, maps, subscriptions to online databases - all of which can be found at local libraries and all of which are useful in discovering who are ancestors were. But how many of us regularly use our local library's periodical holdings in our genealogy education/research? I am usually at our local town library at least once a week for children's programs, but, honestly, I rarely have the chance to browse the shelves for myself. My daughter and I walked past the magazine stands the other day and there I saw Family Tree Magazine. A light bulb went off in my head - why didn't I ever think to look here in the magazine section for titles that may help me with my genealogy research? So, it's all right to rush to the probate record books, microfilms, and online databases when you are doing genealogy research at the big city or state libraries, but don't forget that some great resources might just be found in your local library's periodical department. And of course, the best part is they are FREE!